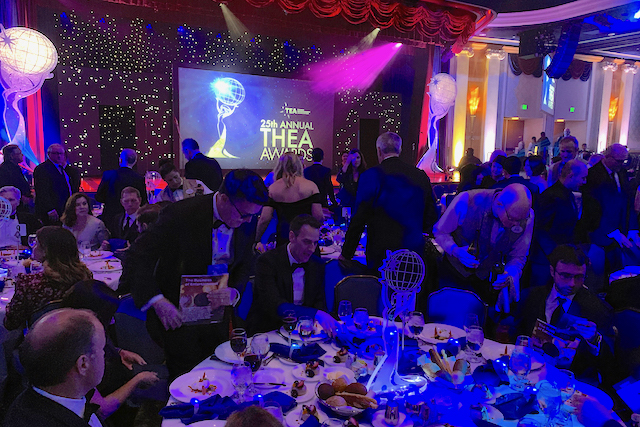 April 14, 2019, 8:53 PM · The Themed Entertainment Association wrapped its Summit weekend at the Disneyland Hotel last night with its 25th annual Thea Awards. The Thea Awards honor excellence in the themed entertainment industry, as judged by select members of the association. 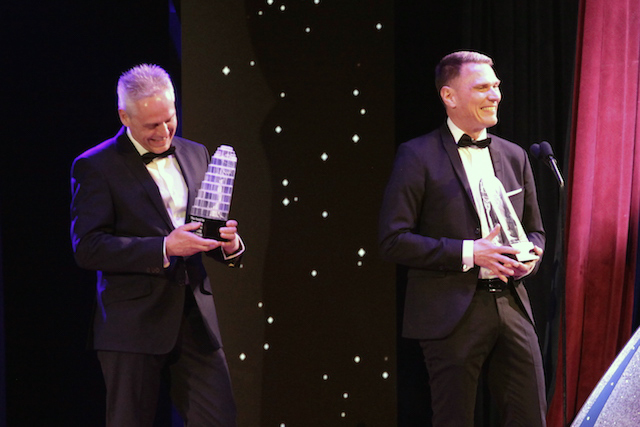 Unlike at most award shows, where presenters announce the winners from the stage, the Thea Awards announced their winners last November at the IAAPA Attractions Expo in Orlando. So this was the opportunity to celebrate these outstanding examples of creative work and leadership. More than 800 people filled the Grand Ballroom at the Disneyland Hotel for a three-course formal dinner, followed by the awards program. 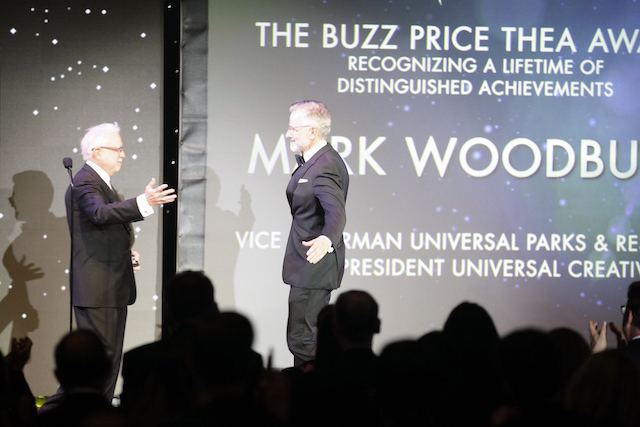 The top individual award of the evening went to Universal Creative President Mark Woodbury, who accepted the Buzz Price Lifetime Achievement Award from the co-founder of Universal Creative, Bob Ward. 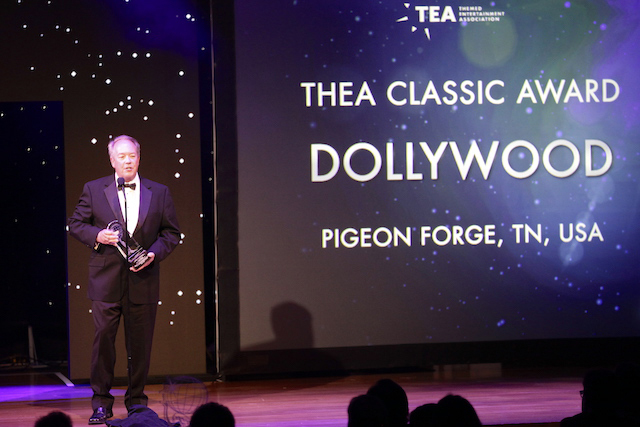 Dollywood won the Thea Classic Award, given to an outstanding attraction or destination that set high industry standards while passing the test of time. Dolly Parton accepted the honor via a videotaped message, while Dollywood President Craig Ross came on stage to accept the award in person. The TEA's Chief Operating Officer, Jennifer Nevin, provided the visual highlight of the evening, taking the stage to honor the Thea Award-winning teamLab Borderless, a projection mapping visual art installation in Tokyo... by becoming a projection mapping subject herself. 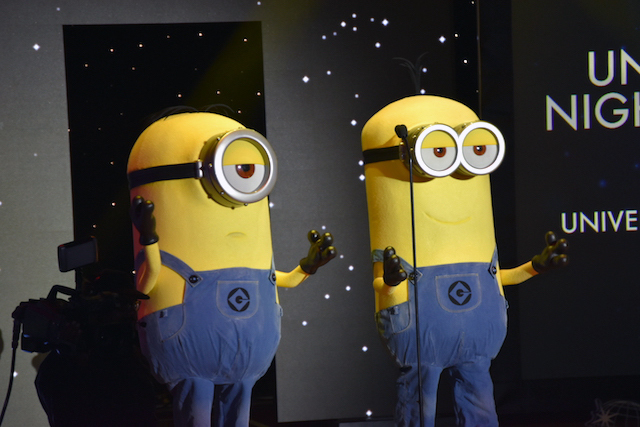 But while the evening honored the people "behind the scenes" at industry-leading themed attractions, a few of the industry's front-line stars made their way to the stage, as well, including Minions Stuart and Kevin, who presented the Thea Award to Universal Studios Japan's Spectacle Night Parade: The Best of Hollywood. Thea Award winners share a single award statue, but the TEA made a clever exception for the winners from LEGO House, awarding them the "normal" Thea Awards statue... and a second one, made from Legos. Congrats again to all of the 2018 THEA award winners (congratulated originally when they first were announced here at IAAPA) and looking forward to the latest TEA/AECOM index with the closest to official figures our industry has for park attendance. You must be registered and logged in to submit a comment.